We wrote the following article last Tuesday as a consequence of expanding on the key word "security" and what is its impact for most of us. Then BREXIT happened on Friday. Actually, BREXIT is all about security, concern about personal security for those who voted to get out of the elite spider trap called the EU. A few thoughts on that will be added following what was already prepared. What is one of the most important feelings one can have for him of her self, for one's family? In a word, security. Security that one is safe in their daily existence, from the time they leave home in the morning until the time they return at the end of the day, and all the time in between. Security that their loved ones are always safe. Security that their efforts for making a life for themselves, for the betterment of their family will not be taken away. Security that what one accumulates in the process of life will always be there. If you ask your family, your neighbors, your friends, all will say no. If you ask the government, you will be viewed as a suspicious domestic terrorist for considering anything that is not government promoted and sanctioned. Since when did the government become the Uberlord over all? Who gave that permission? No one! The government took it, and in the taking, the government has snatched away everyone's security. Where did it start? Follow the money. When were the most prosperous and secure times for everyone [we will focus on America to keep it simple, not to be narcissistic]? When the United States was first on a silver standard until 1834, and then on a gold standard until 1914, they were considered the most prosperous of times, and there were no taxes, no IRS, no overbearing government. The United States was effectively on a silver standard until 1834, thereafter, it was on the gold standard until 1914, with the exception of the Greenback era (1862- 1879). No other countries have been on a gold standard for so long and, not coincidentally, no others have been so relatively prosperous as these two were during their gold standard eras. The same can be said of Britain when it was on a gold standard for almost 200 years, starting in the early 1700s. Gold and silver were supreme money during those times. Everyone who had them also had financial security. Those who had little or none were still beneficiaries of security because that is what the prevailing sense was at the time. Some have always been better off than others, but the have-nots had their own relative sphere of security. Not today. The Rothschilds have essentially been the progenitors of what has become the globalist's agenda of creating a New World Order to rule over everyone and everything. How did it come about? How has the fabric of security that used to be the cocoon each family spun for themselves develop only to have it ripped apart, and also of societies, even nations? They took away the gold. They took away the one thing that represented financial security as the building block for financial and personal independence. No one needed government when they had their own ability to be free of outside control, which essentially means free of government control. The plan of the Rothschilds-*****-globalists has always been to take away all the gold and replace it with infinite debt in the form of paper fiat. The reality of security had gradually been replaced with the illusion of paper wealth. The globalists counted on the public's ignorance of what money is during their bait-and-switch from intrinsic value of gold and silver to the emptiness of the perception that paper was as good as gold. It worked. During the silver and gold standards, the value of the then-lawful dollar hardly changed over the span of 100 years. Since the globalist's foreign-owned Federal Reserve usurped the US Constitution and took control of the US money supply [as Rothschild doubled over with laughter from his grave], the value of a 1913 Federal Reserve Note today is worth about a few cents, give or take a penny. Where once prosperity and security reigned for centuries, over the span of the last century, people now scurry about like lab rats, trying to eke out an existence while government interferes with every single aspect of daily life, where Orwell's 1984 has become present tense, actually starting well before 1984, by many decades. "Four legs good, two legs bad." The elites have used language to control and [mis]lead the masses. Gold and silver have been replaced by paper [debt], plastic [debt], and now digitized accounting of debt [in the guise of supposed wealth]. The frogs [public] are boiling themselves alive, and sadly, those being boiled still look to the government that controls the heat as ironic "saviors." Black has become white. Lies have become truths. Life is a constant form of anxiety. People are not happy. How is it that the recipient of a Nobel Peace Prize wants government control of guns in America as his own government arms the rest of the world with the deadliest weapons known to man? How is it that people have allowed themselves to become so deficiently conditioned not to see the hypocrisy behind every form of government? Even among those who own and hold gold and silver, their minds have still successfully been conditioned. But to their credit, their innate sense that not all is as it seems in the faux "real world" that exists at the behest of the globalists and carried out by those who are in control of governments, including those who were never elected but still control the EU, buying and owning gold and silver is the most sane act one can do. "Stop The World, I Want To Get Off" is a title from a 1966 musical where the protagonist realizes who he is and why, after 35 years of making his decisions. Those who opt to own and personally hold gold and silver are making the best possible decision and stand the best chance in life. There may never be a return to the general security that gold and silver once freely represented, but owning either or both is the closest one will ever come to enjoying whatever degree once can in being secure in a very insecure world. "Four legs good, gold and silver better." As to BREXIT, the closer it came to voting, the more optimistic the REMAIN camp became, especially after the senseless killing of Jo Cox, a British MP who favored the EU. We commented on that tragedy, last week [Insanity Is World "Norm," see pars 19-21]. The night before the vote, it became close to being taken for granted that REMAIN would prevail. Our interest in the vote had a different twist to it. On Monday, 20 June, we posted an article, "BREXIT: As Above, So Below," It was not an article so much as it was a repost from an Australian astrologer who is a Gann advocate, as we used to be many years back. With the Summer Solstice and, more importantly, an afflicted Saturn passing over London at the time of the vote, [As Above, that which is occurring in the stars, impacts which occurs on earth, So Below.] From this perspective, the government's wish to remain in the EU seemed doomed. Would it the Saturn astrological aspect fail and the elite's government prevail, in light of the smug confidence of those in power on the night before and into the day of the vote? The results turned out to be a shocker for those politicians in power seeking to enforce their will over the people so ruled. We have been smiling ever since the results for exit were confirmed, and we trust Olga Morales was smiling even more. All of the market response and upheaval weighs most heavily against those who created all of these precarious financial conditions, mostly the bankers themselves, willingly abetted by politicians beholding to the monied interests. Probably, those least affected and not having an sense of panic are those who own and hold gold and silver. In fact, their value of holdings increased with no risk exposure to the panicking paper markets. However, it is not over. Never expect the elites to just roll over and go away. They have too much at stake. Typically, for those unelected politicians running the EU, whenever there is a vote against their interests, they hold another, and another if need be, until the voters "get it right." We also mentioned that the vote is non-binding. The politicians can find a way not to have it enforced. Given that all politicians are liars and their existence dependent upon the financial teat of the elite's central bankers, which is how the central bankers have set it up in order to maintain to control over governments, we expect the will of the British people to eventually be ignored. We would love to be proven wrong. The charts say to expect more turmoil in the coming days and weeks as the fallout settles in and sorts matters out. The key for gold and silver owners is to wait for clearer and less riskier opportunities that will arise in the weeks ahead. Owners and holders of physical metals are seeing their holdings improve, and over time, they will improve even more. We all know it is not "if," but when. Each passing month gets us closer to the elusive and unknown "when." If we knew when, we would say. All that can be definitively stated is that it will not be a day before it actually happens, and even then, it will be a process over time. It could be that we are already in the "when" window of time, but it cannot be confirmed until after the fact. Keep buying and personally holding physical gold and silver. Last Friday, you witnessed exactly what happens to paper assets when people lose confidence and panic. You also witnessed a preview of what is yet to come: days of gold rallying $100, silver $1. There will be more of those days, and even in greater gains. The two dark horizontal lines on the weekly gold chart are previous failure highs that will offer resistance at some point in the future. The April failed swing high stopped at the January 2015 similar high failure. 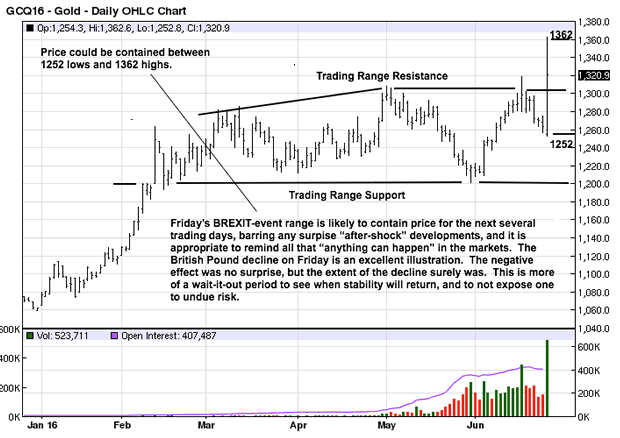 Friday's panic buying in gold saw the next level tested, the June 2014 failed swing high. Gold has rallied $150 in the past month. Some backing and filling would be healthy for this market. The exceptionally wide range for the week may lead to more of a sideways trading affair. It is harder to define paper risks during these times. For physical purchases, we see no risk. You own it. No one can take to from you or devalue it. An ounce of gold is always an ounce of gold. It is measured by fiat pieces or paper. Remember, when gold goes from $1,200 to $1,300, in dollar terms, it did not go up in value. Instead, the number of fiats increased by $100 in order to purchase that same ounce that has not changed. It is ironic that many say there is already a bull market in gold when measured by the Euro or the Pound, for example. No. The fact that it takes more and more Euros or Pounds to buy the same ounce of gold is an acknowledgement that the fiat paper has lost more of its perceived imaginary value. An ounce of gold remains unchanged. It is the deteriorating s0-called "value" of fiat currencies that have worsened economic conditions. Keeping things simple in the current world of chaos, let those who choose to deal in bureaucratic whim, [which also defines what a fiat currency really is], try to justify the unreal as having value. 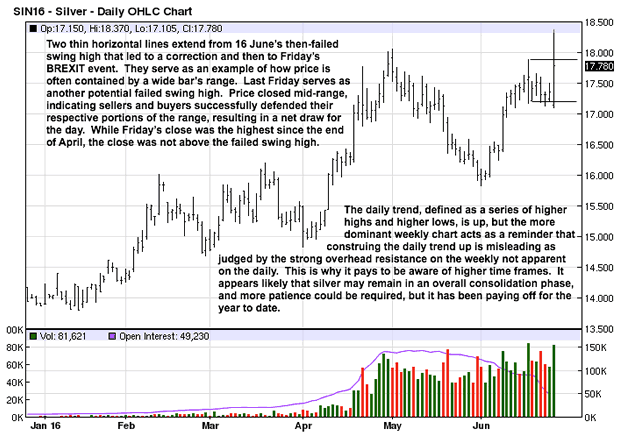 It is an exercise in futility, a fact Precious Metals holders have known beyond question. The EU "emperors" are wearing no clothes, and the British people just acknowledged it in their vote. All of the enormous disruptions in the markets are an attempt to reconcile people's reality and what they want for themselves against political deceits by those in control in order to get what they want, always at the expense of people. The price adjustments reflect the push-pull of people v politicians, and the range between the mort recent spike high, at 1362, and the low, at 1262, is most likely the range where the struggle for control will evolve. This risks are available to anyone, every day. The opportunity for profit is not available every day, at least not without having to take undue risk in the process. We choose to wait for the opportunity that arise less frequently. 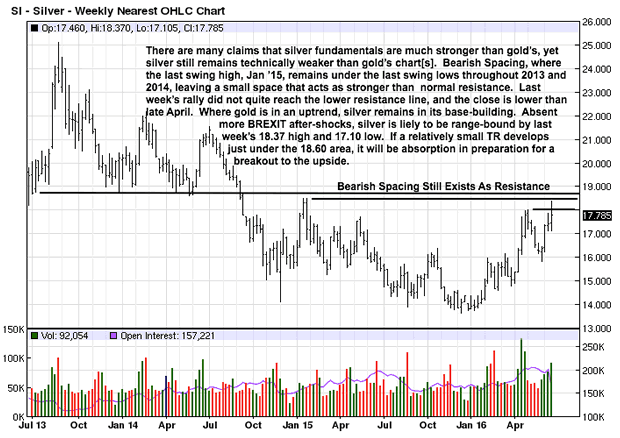 We still see silver outperforming gold, in the future. 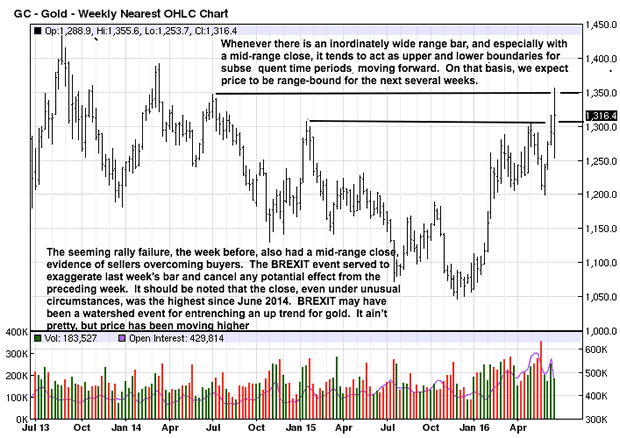 The chart structure is better for gold that it is for silver. Yet, the gold:silver ratio has come in from 84:1 down to 74:1, on any given day. This means silver is outperforming gold on a relative basis. We have no specific target, but the probability grows that the gold:silver ratio can come in to 40:1, 30:1, 20:1. The historic relationship has been 15:1, so that is not out of the question. We showed how the previous wide range bar on increased volume established a price range for silver [seven trading days ago]. Friday produced an even larger range. No horizontal lines were drawn to not confuse the matter. Now, the expected range within which silver may trade in the days, weeks ahead is 17.10 on the low side to 18.37 on the high side. It is questionable if any tradable opportunity will arise within that relatively narrow range, so patience is the guide for the immediate future, unless one is buying physical silver. For the physical, the time to buy is each and every time you have the available funds to commit toward stacking, and one can never stack too high.